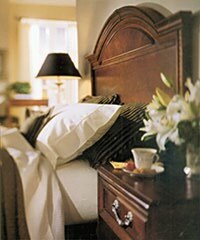 Classic hotel accommodations and rooms with fireplace or Jacuzzi. Enjoy indoor swimming pool, whirlpool and sauna plus fireside lounge and game room. Outstanding cuisine from the Terrace Room Restaurant. Curly’s Up North Bar & Grill provides scheduled, live entertainment, awesome menu selection and the region’s largest choice of micro brews. Horse drawn sleigh rides. Cross country skiing on lighted, groomed trails, dedicated snowshoe trails and direct access to 200 miles of snowmobile trails. Ski shop. Nordic and snowshoe rental for all sizes. McGuire’s Resort, Extensive, not expensive. Located one mile south of Cadillac on Mackinaw Trail, between M-115 and US 131.